How do we know if we can beat the bookmaker? That's easy: just look at our bank balance. But how do we know if we've not just been lucky? More specifically, how do we know that someone who says he can do it, and who is selling his 'expertise', can keep doing it again and again, through talent, skill and hard work? This book examines the techniques available to answer that question, to identify those qualities and to help the punter find value for money in an industry that appears to be largely built on trust and the influence of chance; to uncover the truth about sports tipsters and ultimately how to find the best tipsters  the 'Black Cats'. Joseph Buchdahl runs a website independently verifying online sports betting advisory services to provide a measure of quality control and a means of demonstrating transparency, validity and reliability for a sports tipping industry that is otherwise unregulated. His previous book: Fixed Odds Sports Betting is a perennial best selling gambling book. Accessible, interesting and full of historical as well as mathematical curiosities. Was alerted to this book by a good review in The Times. Be warned, this book came out under a different title ('How to Take a Penalty') when it was a hardback so don't buy both books thinking they are different..
For anyone, like me, who happens to be independently interested in maths and sport, this book is nerd heaven. My personal obsessions are cricket, football and snooker, so I was thrilled to see chapters explaining interesting mathematical facts and approaches to all three of these sports. This is the best 'loo' book you could wish for - and I mean that totally as a compliment! How do you win at sports betting? Hard work and lots of modeling. This book walks you step by step through four winning computer models in NFL, WNBA, MLB and NCAA Football. All manners of gambling are becoming increasingly popular in our society. Whether a person places a bet on sports or gambles on a stock, he is making a decision on risk. Most people need much more information than they have to make good decisions on either. A majority of the book focuses on sports betting. Four in-depth winning models are demonstrated for MLB, NFL, NCAA Football and WNBA. In addition to methods for handicapping these sports, there are explanations of a variety of approaches to exploit sports market inefficiencies and incorrect assumptions of bookmakers. The approaches to stock betting challenges commonly accepted knowledge. How important is diversification? Are investors in individual stocks just gambling? Is maximizing your portfolio growth worth taking on added volatility? Is sports betting a better investment than stocks for some people? The approaches offered to risk taking, especially sports betting are ground breaking, with more fresh ideas than ever seen in a single coherent publication. To elaborate, this is a book that is more of a guide to thinking about gambling in an advanced sense as opposed to a cookbook detailing recipes of how to do various bets. Finally a sports gambling book worth reading. Declan Hill chronicles his experiences with Asian gamblers who claimed to have fixed all kinds of football matches, from low-level Belgian league games to England's 1-0 victory over Ecuador at the last World Cup. The allegation was made by the respected French newspaper Libération. It said that the greatest football match in recent memory  the 2005 Champions League Final in which Liverpool, 3-0 down at half-time to AC Milan, came back to win on penalties  was fixed. Declan has written a well-researched book of investigative journalistic brilliance. A book that deals with the unseen and often shadowy world of soccers match-fixing. . . . A world the authorities try to ignore; the effects of its existence swept under the carpet in the name of preserving the games image. Shaka Hislop, ESPN soccer commentator and former English Premier League and World Cup goalkeeper. Declan Hill has written a book which is astounding in all its parts; the meticulous research, skill in following leads, tying up various and diverse pieces of information, a thorough and intelligent analysis of the game, the power structures of corruption, the legal obstacles and the people. Not only is his writing fluid and his reasoning logical, it is also accessible. 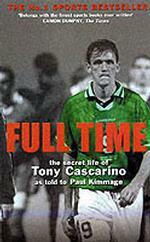 Making the book compulsively readable Kimmage structured it brilliantly, guarding the series of secrets that Cascarino reveals so that the reader is tantalised by cryptic glimpses then made to wait until each revelation in turn is suddenly unveiled. What are these secrets? Suffice to say that some are personal, some professional, some minor and quirky, one major enough to generate heated debate in the press. At times the book reads like the confession of a man who's lived with too much guilt for too long. The Guardian said, "Compared with the standard-issue footballer's autobiography, this is Tolstoy." Perhaps not quite, but it's brilliant storytelling, and gives a shockingly honest portrait of one footballer and his world. . The 1995 Open Champion and legendary wild man of golf recalls the best and worst of his life: his inspirational play on both US and European tours; the demons that afflicted him on the course and his addiction to gambling and drink; and the trashed hotel rooms and spectacular marital problems. John Daly took professional golf by storm when he came out of nowhere to win the 1991 PGA Championship at Crooked Stick in Indiana. A big hitter, Daly quickly became a favourite with PGA crowds for his long drives and no-frills philosophy of 'grip it and rip it.' Almost as quickly he became a controversial figure thanks to his on-course fits of temper and off-course bouts of drinking and gambling. He overcame erratic play to win the 1995 British Open, then suffered through six years of poor play and personal turmoil before winning the BMW International Open in Munich in September of 2001. In February of 2004 he returned to the winner's circle on the PGA Tour, winning the Buick Invitational at Torrey Pines. Daly has been married four times, and his spectacular marriage bust-ups have attracted endless media headlines. His fourth wife, Sherrie, and her parents were indicted on federal drug and gambling charges in 2003; they were accused of selling cocaine, marijuana and methamphetamines from 1996 to 2002 and of laundering the proceeds through local banks. Daly talks openly in his book about his controversial private life, the tantrums, the additictions to drink, gambling and women, and reflects on a new course in life in this richly entertaining read. This chronological, anecdotal excursion reveals surprising facts about golfers' habits and secrets, following them every step of the way during this hectic week. Tournament Week begins with the red carpet unrolling for them on Monday, to the gambling practice rounds on Tuesday on to Wednesday's dealing with amateurs, straight through Sunday, the ultimate payday in professional golf, when the press mounts and even the most poised golfer is prone to choke. Unique behind-the-scenes perspective also examines the practice round, where often more is going on than one would suspect including high-stakes gambling games. From the author of "The Man with $100,000 Breats". Excellent book about golf for fanatics as well as ignoramuses. I liked how Konik reminds us that the high stress of competition and money and stardom don't excuse a rotten attitude on the golf course, or in life in general. The way he describes some golf courses makes you want to log onto the Internet to instantly buy an airplane ticket. There are also some clever chapters -- describing equipment in the style of "Twas the Night Before Christmas" and rewriting the Canterbury Tales to include golf. This supposedly originates from an obscure bet. This time, Hawks bets he can track-down the Moldovan football team and beat them all at tennis. The loser must perform the Moldovan national anthem naked on Balham High Road. However, knowledge of tennis and/or football isn't required to enjoy the book. It is an entertaining, easy read that will make you chuckle. This book is a result of enormous amount of work. The statistics include also lap charts of every race run until today. Paintings include almost every model of each manufacturer. The pictures on the book could have been perhaps a bit larger, but in the contrast there are lots of them and enourmous amount of information. The book tells the history of every team until today. I would say, this is not quite race by race covery, but most important races for each team each year. Notice that the book is TEAM based, not RACE based, although there is a short common history. The profiles of frontrunner drivers throught the years are also included. The circuits are covered in their every form raced. Even different chicane shapes are shown. Of course some very slight changes to chicanes are missing. A must for the statistics. The best sporting stories are human dramas, and Lance Armstrong's is one of the greatest. At 25, the American cyclist was diagnosed with cancer. He fought it, beat it and three years later, amazingly, won the Tour de France. This is a gripping story: from tough, fatherless childhood (he pointedly calls his absentee father a "DNA donor"), through devastating illness, to triumph in the toughest endurance test in the world. This is the most revealing form guide to Germany 2006. In tandem with the "BBC/FIFA World Cup Stories", which looks back on the rich history of the world's biggest tournament, Interact Publishing and the BBC also look forward to the World Cup 2006. The Match of the Day team, led by Gary Lineker, will be the viewing public's first choice when they settle down to wallow in the 2006 World Cup. This guide will be the perfect accompaniment to that TV coverage. 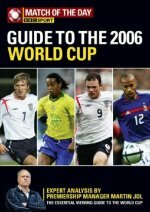 The MATCH OF THE DAY GUIDE TO THE 2006 WORLD CUP has been tracking 4000 of the worlds top players to produce a unique World Ranking system so every key player going into the World Cup will be ranked for their form over the preceding year. A celebration of the world's No.1 sport, providing essential information on not only the world's leading international and club competitions, but the famous players, the great clubs and the classic matches. Contains comprehensive statistical coverage of the world game and all the principal records. The book is extremely well organized into interesting categories such as: 1. The 300 Best Players 2. The 100 best Games - outside of the play-offs 3. The details of every draft for every team since the draft was initiated. This feature is my personal favourite since it allows one to objectively analyse the process of building or not building a winner and who did it. 4. The history of every player whoever played - teams - position - performance. Mandatory as a source for all serious discussions on the performance of a player - How we remembered it versus what they really did - very helpful and interesting. Overall this is a MUST book for any serious fan of the NFL. Jack Iverson played five Tests for Australia half a century ago. His first-class career lasted barely three years. Not obvious material for a 376-page biography, but Gideon Haigh has written a superb book about him. Iverson didn't play top-flight cricket until he was 31. His rise thereafter was meteoric, but he never quite believed in himself and quickly abandoned playing for both Australia and his state, Victoria. He had a key role in retaining the Ashes for Australia in 1950-51 but then declared himself unavailable.